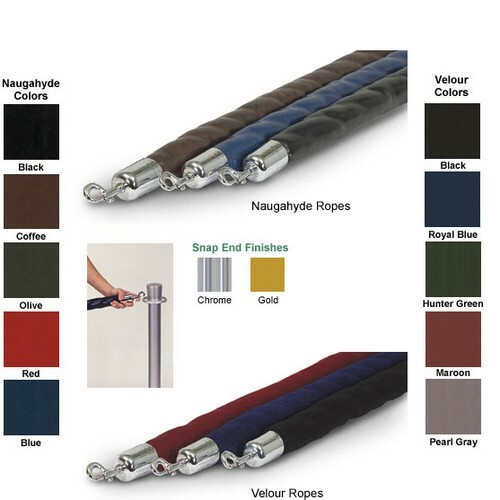 U.S. Bank 8-foot ropes in a choice of five velour and five Naugahyde colors, as well as chrome or gold anodized snap-end finishes. Velour ropes are soft velvet fabric surrounding a compact cotton tube and are perfect match for upscale settings. Naugahyde ropes in tough leather-like material also surrounding a compact cotton tube. Naugahyde is great for heavy use. Both ropes are 1-1/2" in diameter. U.S. Bank 8-foot ropes in choice of five velour and five Naugahyde colors and choice of chrome or gold snap-end finishes.